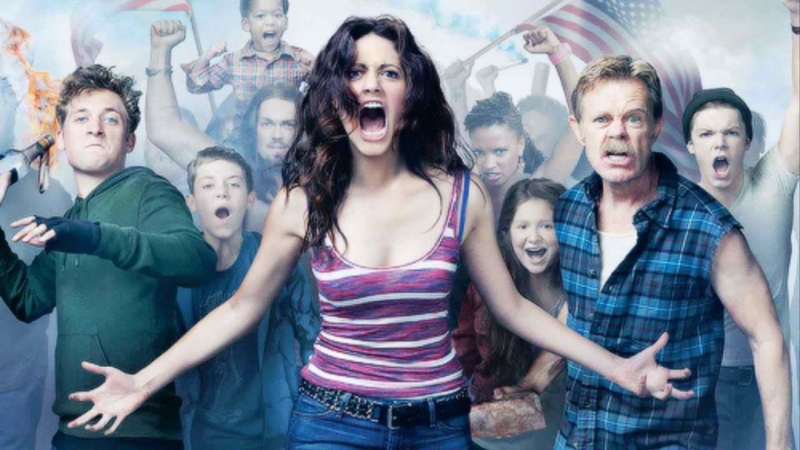 For a show to remain as consistently strong as Shameless has up until its fifth season is no laughable feat. For it to have delivered its strongest season last year is even more impressive, so the fifth season is getting underway with a bit of pressure on its back after a stunning previous season. Last year we bore witness to the Gallagher clan falling to their lowest lows. Fiona took an abrupt and aggressive downward spiral of poor decisions and addictive tendencies. Her dependency on the antithesis to stability lands her behind bars after Liam ingests some of her cocaine; she’s put under house arrest, distrusted by her family and officially at rock bottom. Frank is on life support for the majority of the season as his kidneys start to fail him. Ian begins to face some of his family’s genetics as his mother’s bipolar disorder starts rearing its head, and Mickey deals with his sexual identity and the loneliness that hiding means. Lip is stranded at college, far from his family and dealing with personal stresses that he’s yet to have to grapple with. Debbie must deal with burgeoning feelings of young love and peer pressure, and Carl is just Carl. By the season’s end Fiona has taken tentative steps toward regaining her old life, Lip is in a mutually beneficial relationship and doing well at school, Mickey has come out to his father in easily the most energizing and triumphant scene of the year, and Frank, well… Frank’s alive. Ian is the only one by the end of season four who still feels like he’s majorly adrift. The season begins similarly to the rest thus far. It brings us back to our favorite dysfunctional family in summer and things are looking up (which really is never actually a good sign). Fiona is still working as a waitress and flirting with her boss Sean (Jeffrey Dean Morgan was replaced by Dermot Mulroney). She’s content at her job, acts protective and sweet with Liam, and is being hit on by every human being that walks into the diner she works at. For the first time in a while Fiona seems her age. She’s still responsible and a backbone to the family, but she’s having fun, enjoying her summer and laughing a lot; it’s a welcome change. Also, Jimmy/Steve doesn’t show up, just to get that out of the way. Lip is back from college and is feeling the weight of his girlfriend who’s in Miami for the summer, who buys him a nice watch as a parting gift and offers up living together the following year. Now having seen a part of the world separate from his home, he has new ideas and motives and going back into a world where there’s pride in the underdog mentality starts to put him on edge. He lies about his watch saying he stole it instead of saying that it was a gift. Being away has begun to put some things into perspective. I love a good Lip storyline, and his struggles mixed with the beginning hints of the gentrification of where they live is going to be an interesting plot through-line for the show to focus on for the season. Mickey and Ian continue to be a relationship that’s worth tuning in for alone, however my favorite Mickey moment happened without him. Instead it was him, Lip and Fiona, and watching Lip’s genuine amusement at Mickey’s antics. Boy am I excited at the prospect of Jeremy Allen White, Emmy Rossum and Noel Fisher sharing scenes together this season. These three actors are the three strongest actors in an incredible dynamic, versatile and strong cast, and if this season continues to put them in scenes together it will already be a win for me. Lip’s genuine laughter at Mickey’s errand was a small, seemingly inconsequential moment of the episode, but it allows for the show to showcase the natural chemistry the cast shares. The episode didn’t end unscathed, however, as there is one storyline that has only grown more and more annoying as the series has progressed. The blatantly apparent dead weight on the show comes in Sammi, Sheila and even Frank’s storylines. The first two are such obvious detractors to the more engaging storylines and characters that it’s hard to justify their worth to the show. Joan Cusack is great in her role, but Sheila should have been written off seasons ago and Sammi is simply tiring. She served a narrative purpose last year but now is floundering. I understand Frank’s place as the persistent, nagging antagonist to the younger Gallagher clan, and William H. Macy has done incredible work as the character, but the longer he’s around the easier it gets to forget why he was even interesting in the first place. I don’t know how well I’ll stomach a season of Frank simply trying to create a beer that knocks him out with one sip. Regardless, this was yet another strong season introduction with the show taking on a lighter, more comedic tone than its predecessor, which fits with the summer mood. However, I never trust the show when it allows its characters to be happier for longer than three minutes and we already see hints of them unraveling. Ian is coming apart slowly but surely, acting on his hyper-sexual impulses, and Veronica and Kev are having troubles with their marriage with infants to attend to. I’m concerned but excited about the narratives set up for the upcoming season and can’t wait for the undoubtedly wild ride ahead. What were your favorite parts of the episode?